Katy Perry visited a sick fan in Australia on Tuesday after she had to miss the singer’s concert because she wasn’t well enough. The eight-year-old fan, Grace Moores, was looking forward to the Hot n Cold hit maker’s show on Monday but was forced to miss the concert due to her brain surgery last week. 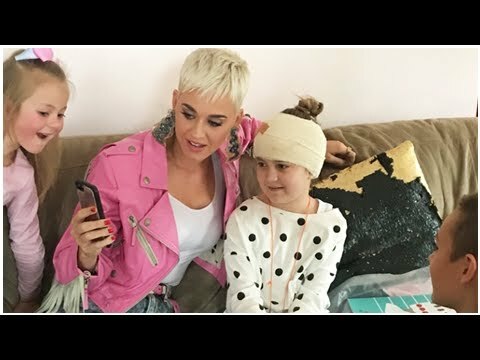 Tiana, her older sister, started a campaign on Twitter to help Grace meet Katy. She uploaded pictures of her younger sister in a hospital, of the surgical wound at the back of her head and of her head wrapped up in a bandage. She tweeted that Grace was diagnosed with a 6cm brain tumor and was Katy’s biggest fan since she was three. She also mentioned that Grace was battling with health problems throughout the year, and had to miss the show because of it. Her message caught Katy’s attention after it was retweeted 22,000 times. Her team arranged a house visit to the Moores just hours before the singer’s another concert. Tiana was quick enough to share pictures of Katy. She was wearing a pink leather jacket, a white top, and blue jeans. There were some clips as well in which Katy was seen hanging out with the family. She also sang an acoustic version of Roar for Grace. Apart from that, the popstar also documented the visit on her Instagram story. She uploaded a video of Grace still wearing a bandage and a Witness T-shirt. She called the young fan her new merchandise model.